We’ll cross paths with many men along the way but there’s just one person we’re destined for. 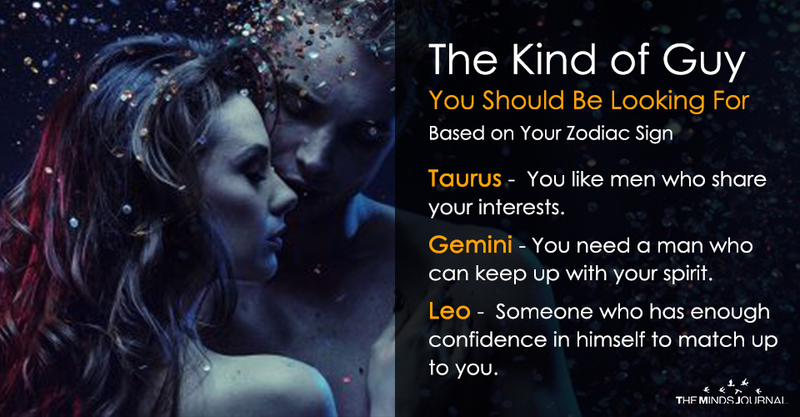 Keep reading to find out what kind of man you should be looking for based on what the stars have to say. You crave meaningful discussions and it is something you actively look for when you decide to commit to one person. So don’t stick around with a man who likes to indulge in frivolous chit-chat. Go for the man who likes to jump straight to a conversation that makes your mind tingle. Look for someone who doesn’t take anything at face-value and is always honest with his criticism as well as his praise. Romance is what you live for and there’s nothing you’d like better than a man who will woo you the traditional way. Look for a guy who is ready to make grand romantic gestures to win you over. He has to understand that you want a long-term commitment so that you don’t end up disappointed. As an Aries, you burn like the brightest of flames and any person would be lucky to be loved by you. When you enter into a relationship, you give it your all. You never let a day go by without showing your partner how much you care about them. Look for a man who is attracted to your confidence and love for adventure. He’ll need to be strong so that he can keep up with your own strength and ambition. But he’ll also need to be soft so that he can love you as much as you love him. ‘Look before you leap’ is your motto so you take your time committing to a partner. You like men who share your interests. As someone who is deeply committed to your family, you look for someone who treats their family the same way and has ambitions similar to yours. He has to have a wealth of patience and love, enough to adore every single part of you. He has to understand that you need time to get to know him so that you can be comfortable around him otherwise you’ll never be able to be fully at ease around him. Boredom is one emotion that you end up feeling way too often. As someone who is full of passion and intelligence, you need a man who can keep up with your spirit. He has to share your generosity and love for a good time. It’s going to be hard to find someone who can match up to your flirting skills, but rest assured, there is a man out there who can match your intelligence and wit word for word. Your emotions play a big role in making you the person that you are but at the same time, you tend to get overwhelmed by their intensity and this has often led to heartbreak. However, this will serve you well when you meet your perfect gentleman who will be ready to hold you and comfort you just the way you deserve. He’ll take the time to fully analyze the way you’re feeling and he’ll do what he can to help. He has all the strength needed to be your shoulder to lean on but he is also soft enough to understand you. Your connection will be so strong that the two of you will often be able to communicate in silence. You are a natural when it comes to meeting and interacting with new people but you’re never more charming as you are when you meet someone who catches your eye. You need someone who is intelligent and trustworthy, as well as adventurous both outside and in bed. He has to share your love for fun but be persistent enough to make you take the relationship seriously.